The Undertones formed in Derry in 1976. Members were John O'Neill, Diamian O'Neill, Michael Bradley, Billy Doherty and Feargal Sharkey. They released four albums between 1979 and 1983, of which 'Positive touch' (1981) was the third. 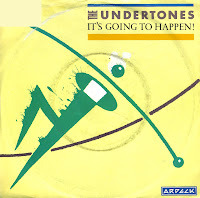 This album contained the single 'It's going to happen'. 'It's going to happen!' is the only song by the Undertones that made it to the lower regions of the Dutch charts. Other singles fared pretty well in the UK, but outside of the UK they were pretty unknown. Singer Feargal Sharkey left the band in 1983, to pursue a more successful solo career.